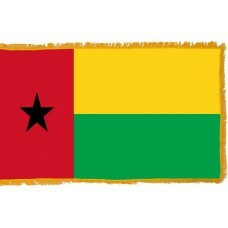 Officially adopted on the September 24th, 1973 the Flag of Guinea-Bissau is comprised of two equally sized horizontal bands of green and yellow with a red vertical band running down the left side of the flag that has a black five pointed star in the center. The star stands for African unity, the color red stands for the blood shed for gaining independence, the color green for hope, and the color yellow for the sun. Before independence, the country was known as Portuguese Guinea as it was colonized by the Portuguese during the 19th century. Upon independence being recognized in 1974 the name of the Capital city was added to form Guinea-Bissau as the official country name to stop it being confused with its southern neighbour Guinea, once a French colony. Guinea-Bissau shared this flag with the Cape Verde Islands for a number of years when they were a joint country having worked together to gain independence from Portugal. During colonial times the two had been tied together as they were key to the slave trade. This was due to the Cape Verde islands being a transit point for the slaves being shipped out of Guinea-Bissau for onward transportation to the Caribbean, USA and Europe. They only formerly separated in 1980. 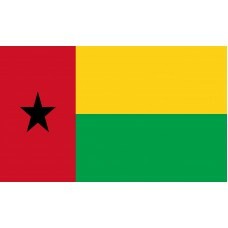 Like many African countries Guinea-Bissau suffered after it gained independence. The Portuguese civilian, military, and political bodies exited very quickly causing a breakdown in the economic infrastructure and coupled with the political instability that then followed it made Guinea-Bissau one of the poorest countries in the world with about two thirds of the population living under the poverty line. Traditionally it has been reliant on its agriculture with ground nuts and cashews being the main exports together with fish. The country is rich in natural resources such as bauxite, phosphates and timber and its rich fertile soil could provide many more crops for export so there is hope that as the country stabilizes it can build on these resources to improve its GDP. One area that is beginning to expand is tourism and especially Eco-tourism as the country has a number of well-known national parks. The archipelago of Bijagos is a UNESCO biosphere reserve comprised of 88 islands sitting off the coast of Guinea-Bissau famed for their diversity of mammals, birds, reptiles, and fish. There is also the Orango Islands National Park which boasts a selection of palm fringed beaches on many of the islands, but also beautiful woodlands with rare bird species and swamps renowned for salt-water hippos, crocodiles, and turtles. Other popular tourist destinations include the old colonial buildings, many of which are now ruins, especially those in the old capital of Bolama. Work is being done to preserve some of these buildings such as the Cacheu Fortress which was built in 1588 and had restoration work completed in 2004.